Big Brother star Hughie Maughan will reportedly star in the new RTÉ show Dancing With The Stars. It's believed RTÉ has finally chosen the 11 celebrities who will take part in the show after conducting auditions. According to The Sun, Hughie is the first to be officially confirmed with the Dublin native spotted in training already. Hughie's fiancé, Ryan Ruckledge, who he met on Big Brother, fueled speculation last month that Hughie would be taking part in the show when he tweeted about Hughie having something lined up. Hughie is the only celebrity to be named for now but it's thought that Nicky Byrne will be signed up to present the show when it begins in January. Nicky was named a few months back, along with Vogue Williams, but after she ruled herself out recently all eyes are on Nicky. 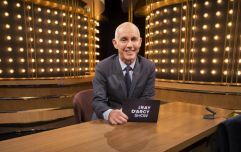 The show will begin on January 8th on RTÉ One and will run for 12 weeks.